The drawstring was proving to be more difficult than it should; this was, sadly, no surprise and failed to elicit any kind of reaction. A quick tug was normally enough, but at this precise moment every move was granted only half her strength; she was done in. Time would allow the hollow sensation within her to ease, to have her gaze focus once more rather than leaving her to stare absently through things. Time would get her moving, putting distance between herself and the trials of the night. Time would offer distractions. She didn't have time. He was there, even as she fumbled absently in her attempts to cleanse the blood of her torn knee, and for a moment everything came crashing to a halt - at least for her. He lay beside her, touched her, a solid reassurance that she wasn't alone. Spoke kindly; called her his love. Looked at her with a tenderness that saw the beaten version no other had ever born witness to, and did not judge her for it. Her mind spun for a long moment, failing to reconcile his sudden reappearance, waiting for him to be gone again just as quickly. But he was real, and he was there, and he looked a right mess himself, so coated was he in dirt. Clumps gathered in disheveled masses in his mane and he looked as if he might fall over sideways, a bone-deep tired revealing itself around the corners of his tender gaze. It seemed he had not rested even the nonce that she had managed. And all the while she had been here, having a proper melt down. Some welcome she was presenting him with, now, to stare at him as if she had perhaps been struck blind. Gyp-Gypsy, she managed, and her words were slow, uncertain, and very nearly flat, the usual rolling southern-tinged joy nowhere to be found. My wandering Magpie has returned, she thought numbly, and wondered if such a stark leave was to be normal, between them. Less that they had walking roots, more that they would always blow back together again, as dandelions on a playful breeze. Could she bear such a thing? At the moment it didn't seem to matter; simply another pain to carry. She should try and brush the dirt off that beautiful hide, to make at least some attempt to return the care she saw in his gaze. She should ask what had happened, if he was alright. She should do at least something to make certain he had reason to be glad to have found her again. Instead, she found herself shaking out her mane as her head grew heavy, dropping down to rest on his front legs. Her voice cracked, and for a brief moment a flicker of embarrassment fluttered to the surface, her words swallowed by the all-too-fresh memory of her own insignificance. Forever the outsider, never to belong. I'm sorry, she managed, and then everything went black - at least it was here that she passed out. There could be worse places to have her body crumple on her. There had been already, if truth be told. She struggled with the contraption on her neck a bit, and he itched to help her but held back and focused instead on listening with all his might for what had her in such a state. Her eyes were glassy and not focused on the surface but thoughts swirled and emotions swam in those amethyst depths, too deep and changing for him to interpret. Her words took long... oh so long to string together. If he had not been lying safely on the ground next to her those sturdy legs might’ve buckled on him as she accused him of leaving. Not that there was any accusation in her tone. Not that it was untrue. As he struggled to find a mental foothold to talk through things with her she apologized. And fainted for real this time. There was no question this time, no panic and rush to check on her. He certainly did look instantly at her sides moving for air and reached to feel her heartbeat, though he moved with a sadness that showed all the years of weariness and loneliness he’d borne. I’m so sorry, my dear one he whispered to her slumped form with a gentle whuff on her cheek. Sure enough, there was a definite beat of her precious heart as he brushed her velvet skin with a gentleness devoid of any of the earlier playfulness. Gypsy would not allow his mind to speculate on where this would leave them. The swelling balloon of hope in his chest had definitely punctured and deflated, but that was a matter for later. Scanning the grass in front of him and trees in the distance showed no threats. Their little ring in the grasses was the closest safe place and would have to do for now. Perhaps when she awoke they could find a cave, but there was no chance he was leaving her side now. He would rekindle the fire and wait with her to find out if his chance with her had been wasted. Standing with a heavy sigh the stallion started ripping up grasses around them. It did not take him long to weave the resilient strands into a harness of sorts, which he looped around her legs and under her shoulders, neck, and hips. Not much time had truly passed, but the process seemed to take hours in his worried mind. Once he was ready to move her he bent to the task of removing the wrap from around her neck. It was a bit stubborn, but when he finally grabbed the lip of the purse itself, the top opened just a hair’s breadth and splashed a tiny drop of water on his nose at the same time he recognized the beautiful scent of fresh water. Well now that’s an interesting trinket. The loop of the water bag was kept with those of his grass harness as he readied himself to move her slumbering form. Her lower legs and hooves dragged a bit on the sand when he strained to lift her as far off the ground as he could, but the grasses held firm. Would have been easier had there been an easy way to get her onto his back but the stallion was not willing to cause her possible pain to get her there. He’d debated weaving a blanket to move her and decided the harness would get her moved faster... but now he wished he had made the blanket to cover her with after. She looked so peaceful after he settled her near their fire ring. Now to work on that fire - sunlight or no it was chilly at times when the breeze came in the right way. He found a few small windblown branches among the grasses nearby but he was not willing to stray out of calling range or sight. Those helped the leftover driftwood catch after he rotated the pieces that had already burned. A handful of them still had some uncharred edges, and the smaller kindling lended aid when he sparked the beginnings of a fire. Gypsy retrieved the food bundle and moved it with the water bag closer to her body, opening the bag to allow himself two sips of the refreshing liquid. He would not leave her to go to the shore for a wash or to experiement with how the bag worked. So he settled himself with a groan near Tribe to watch both her and the spreading flames of the fire, watchful in case he needed to give the latter a nudge or a helping hoof. When it seemed to be coming along nicely he reached for more grasses to weave. He sang a gentle song in between grabbing strands, pausing now and again to study the mare who’d entered his life like a whirlwind. He desperately hoped that she would be ok, and that she would not leave it in the same fashion. Or at all. When the grass blanket was ready, he draped it over her and cast her slumbering form a worried glance. There was debate over trying to waken her, but for now he decided sleep might be best. He thought of the salts he could picture on a shelf in his Bonded’s work wing. They could wake the dead, he thought with a shudder at the memory of the tiniest whiff from a theoretically closed bottle. There was no way he could wish that on his waterlilly though, not if it could be avoided. Once more his larger frame settled closer to hers, lying on her other side with his neck draped over her back. His nose stretched over her body to rest closest to the fire, and give him warning should the wind change and coax the fire in her direction with that grass blanet. It was green, so it would not burn willingly, but he wanted to be careful. That done, a large sigh escaped him before he scanned the area for danger one last time and began humming some nonsensical lullaby melody as he drifted off to the doze he could no longer avoid. His last thoughts were of the lovely purple-hued mare dozing under his neck. There was nothing while she first rested. Sweet, peaceful darkness consumed her mind, leaving all available energy for repairing the overwrought damage she had done to her form. She knew nothing as he moved her, nothing as she was coated with grassy warmth, nothing when he finally lay to rest himself. She floated on a wine-dark sea, drifting freely. Eventually the dreams came, vague impressions without forms. Drifting, wandering, traveling, a sense of motion came to her first, one that quickly rolled into urgency; running, fleeing, chasing or being chased, or both, somehow. She stumbled onto a beach, literally stumbling in surprise as her legs gained weight and form, her urgency so overwhelming before that she had noticed only the never-ending chase. He was there, her Magpie, and there was a chasm where his chest should have been. He dripped fire instead of blood, a creature of fire and magic as he was. "Our time meant so little to you, then," he told her in the flat tone of death that one only hears in dreams, "I struggle in a pit and you cast aside any meaning between us, any faith in what we could have." "No," she cried, and felt her own chest crumble as so much sand under the surf, felt her breath leave her as her head spun. "No, I cherished our time, I cherished you!" He snorted, turned, became the campfire they had shared, burnt to ashes and coals, a mere memory of the warmth she had known. Her bonded was there, where he had sat, and looked upon in the shape of her wolf; fire, light, a living flame from the heart of a star, the fur-like texture rippling as if in a constant wind as flames shifted and danced. Brighter than the dead fire, and eyes sadder than the whole of the night around them. "I don't know what to do," Tribe cried, and fell to the ground as the shadows closed in, her chase still urgent. and then a yank on her tail, warmth on her back, and she was in a desert, far from the sea, from any kind of water that she could smell. He stood there, brilliantly beautiful, life-giving warmth washing over her, refusing to look at her. "Though it was so much nothing for you," he told her, "you are precious enough for me to return for you." "It wasn't," she pleaded, and sank deep into the sand as she tried to stand, to go to him, to explain somehow. "Please listen, it meant everything to me. Everything." Movement made it worse, and he still wouldn't look at her, so she grew still and spoke even as the dark sands closed over her head. "I was wrong to guess your mind, but you are still new to me, my beloved sunset Magpie. Everything is a guess right now." He turned to her as the sand covered even her nose, and she felt the faintest hint of a kiss upon her lips before he said "Then rest in my warm embrace, and guess no more." Tribe stretched gently as her confused dreams faded into the warmth of waking, and it took a few moments to reconcile reality with the fantasies of her mind. Warmth and gentle, constant pressure; was she cocooned in sands, after all? 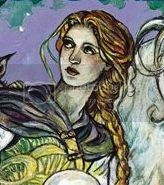 No, it was better than that, better than any mere dream; a blanket of grass and the warm weight of Gypsy's head upon her back, a low fire on her other side just barely flickering with life, and mid-day sun overhead to bake the lands. Her heart fluttered as she looked back at him, and she knew that the time for withholding binding promises had passed. If he would not swear to her, then she would swear herself to him at the very least, for he had seen her darkest sorrows and not fled from her side. She could never repay such kindness. Though at the moment it felt as if she were close to at least trying to reach a similar level. She was loathe to move, and yet the simple truth of the matter was that she had to pee. She would try her best to wait, to let him sleep, and hope that the little bit she had moved so far would blend in with the normal adjustments a body made while resting. The instant he woke she would dash for a bush, but for now, at least, she could try and afford him at least that much more of a rest. Her own dream whispers leaked into his, bleeding into the exhausted blackness that draped him in peace and seizing on the worries and doubts in his mind. As she saw him standing near in the sun baked sands of his homeland with cold utterances leaving his lips he wanted nothing more than to draw close, to comfort. He was in her vision however, her dream. And her hold was stronger. Words he wanted to say didn’t come out, replaced with other words he could not guess the origin of... Those fears of hers tangible here - nigh on pulsing in the very air. Her form sank into the sand and he battled the grains beneath his hooves as the sands turned to grainy sea. Too loose was it all, liquid but not, providing no hold for his hooves as he struggled to remain upright. Tried with all his might to reach this recently found treasure. And still she slipped away, disappearing just as his lips brushed hers. As her consciousness released the dream, his held more sway. But without her to fight for, he wondered what could possibly be the point. Now that he could hope to command the sands, he had no will to do so. Vivid body sank into desert sands that became more and more ocean that gobbled him up and swallowed him whole. Next to Tribe, Gypsy let out a few strangled noises and with a few fitful jolts he woke. It took a few gasping breaths to look around and realize he had been in a dream. Even though at first he had known it had been her dream. Dreams are so strange, he sighed out to her as he dropped his head into her shimmery aquamarine mane and inhaling deeply. Her scent was so earthy, such a heady breeze to the senses. All he had in him was to look to this wonderful mare for guidance. What... now? First - this, she said, and gave him a sound kiss even as she squirmed out from under him, one that left her muzzle tingling - and hopefully his. Then she dove for a spot of privacy to find that much needed relief. She felt her head spinning even within those few moments, all the many things that had occurred attempting to reconcile at once. What do you want from me? Why don't you run from me? Why aren't you scared of me? Why do you care for me? She didn't take but a moment to seal it all away, even with the episode of the previous night. It was simple, in the daylight at least - the storm that swallowed her before was now just a lake. The surface was smooth, a sheet of glass that held not a ripple, even if the currents would tear limbs apart. But nobody could see the harsh currents; just the deceptive surface, hiding the water that tore at the banks if you bothered to go deeper. When she stepped back out she was composed, smiling even, but her eyes churned; still recovering, for a day or two at least. If someone knew how to read her. She was so used to being around strangers, around those that could never hope to know her heart, that it was second nature. With her mindset it was little wonder that even something as simple as savoring in the image of him could turn darker inside of her. The way she drank him in, it was as if she wished to drown in him; at least to drown the doubts that had long since taken hold. Gods, how much longer could she go on like this? She wanted it to end. How did it even get this far, she thought, walking just a touch slower than was perhaps necessary as she grabbed one edge of her water bag and allowed the weight to draw it down, to open the drawstring for her. Honestly, I thought that I would be dead by now. Why don't you run from me, why do you care for me, she thought, a moment's break in the surface of her still lake - and swallowed again just as quickly. Well. If he truly did, she would soon know. As soon as she said it. The realization added distance in her mind, a disconnect that made her feel as if she were nearly a passenger in her own skin. It was a sensation she was familiar with - she had used it to her advantage more than once when death dogged her heels, keeping the panic at bay to allow clarity, letting her move with efficient fluidity. It felt like watching one of her own performances as she lowered the water bag to the sand, the agate flexing into the interlocking pattern to provide the solid base that would allow them to drink from the bowl. Now we drink, she smiled, and lowered her head to savor a long sip, taking nearly half of what was left - it seemed selfish of her, considering how much she had already drunk the previous night, but the thought was tucked away with the long list of her other failings almost absently within her current disconnect.If we're lucky we may still have food, she added, and looked at the prized treats he had brought with him all this way, through all this mess, with a fondness that almost appeared casual. Say it, spit it out, she thought, and took a slightly deeper breath than was strictly required; the last gasp of air before leaping into dark waters. And then, she said, finally facing him directly as her heart fluttered helplessly, then, my Magpie, I'll follow you until you chase me away, and you'll be cherished as the mate-of-my-heart; as the sunset that would not leave me alone to the dark and the fire that warmed a drowned soul. Her mind spun helplessly as her heart all but stopped, and she had to struggle to suppress a sudden shiver. If nothing else, she could find peace everywhere but her dreams, if he would just allow himself to be trailed by his most devoted fan; but when she fell asleep, well, that would be anyone's guess. Where did any of them go as they dreamed? A journey that all took and few grew curious about, but she even explored the realms of sleep. Perhaps, at some point, they might explore even that strange place together. If he would have her stay at all, after seeing her through such a night as that. Gods, for him to have seen her in such a state so soon... The very realization had her cringing inwardly. She nearly felt like burying herself in sand before he could even gain a chance to speak, to disappear on the spot. Goddess, what had she done? To declare such a thing, to be so forward after such disaster! Just swallow me up, she thought of the ocean, willing a tsunami to come and drag her away, even as her heart resumed beating after skipping painfully. Swallow me up and end my foolishness, before he runs. Gypsy enjoyed the kiss, too relieved that she still held her affection for him after all the night’s craze to bother worring about his sandpaper dry mouth and the delightful breath that must result. Her motions held enough tense pee-dance essence about them that he was not surprised to see her scuttling for cover. Come to think of it, it was high time to take care of his own complaining bladder. Even that did not take him too far nor too long. He returned moments later to wait while groggily rubbing sleep-sand out of his eyes with a foreleg. The sunset stallion was quite aware of the few words she had uttered after his disastrous bout of being detained earlier. The heartbreak achingly clear on her face... You left... That memory would stay with him for a long, long time to come. As she returned his brows furrowed in a display of his struggle to make heads or tails of what her expression revealed. There was a distance in her eyes, a resolve. Almost reminded him of the expression of a friend who had sacrificed himself for the good of his family after the decision had been made. Which quickly made his heart clench and his form freeze as though to stone as he awaited her decree. There was a longing to her glance, which made him wonder what rejections were in store, what denials. Dread coiled in his core and yet he fought it down. If she did not speak her mind soon, he would have questions and plenty of things he needed to say. Was it only yesterday they were giggling like foals over clumsy falls? She drank deeply, which reminded him of his own parched tongue. When she mentioned food and threw a glance at the rather wilted packets his traitorous stomach growled as though glad to finally have someone sympathetic to the idea of eating sometime soon. He grabbed the larger leaf - still rather neatly folded and tucked - and started toward the lovely mare before him. It was a near thing, almost dropping the thing into the sand again as he listened to her words. Now he stood before her with wide eyes and nearly gaping jaw. Now it was his turn to skitter as he hurriedly placed the package safely on the ground. Had life come to slow motion? Or was his brain simply on overdrive? It skittered across their meeting once more, to the proud sailor he’d met adrift just when he’d needed a friend. To their traded snippets of tales and then to some more dramatic storytelling, hearing a sigh of relief from his heart to be sharing his adventure with someone. And not just anyone. To the exactly right wondrous, dazzling creature he should be sharing it with. To the seeming shift of gravity that seemed to make his world revolve around a new axis - her. The unexplainable pull that just made being near her so very right. Lovely Waterlily, my Tribe. I shall never chase you away. Nay, rather I shall keep you close as you will allow. He stepped forward to rest his forehead against hers. I should like to follow you on your adventures and bring you along on mine, and to keep buying more time with you until I can convince you to be my Circle-mate as well as my heart-mate, for I love you truly. He spoke the words with strength, though the hope nearly overwhelmed him. She may well scoff at him, but he was not one to bide time or hide emotions. Rebuke him she may yet... though he was starting to get a certain niggling in his brain that she felt as he did and would not rebuke. With her, he would only be true to his heart. These lives we lead, dashing from one adventure to the next, only to fall into another fiasco from there... They are woundrous and lonely and dangerous at times. And they are worth living and loving wholly. A deep sigh escaped him as he let all of his uncertainties go, freed them to float away on the breeze. I apologize if you should feel I rush you with my request or that ‘tis not appropriate yet. But somehow I can feel in my very being that this is right, and that it is you I shall walk next to through the night and into the dawn.